I squirm in my bivvy bag and try to pull the fabric up over my face completely, thus limiting my ability to breathe, (on the down side), but, (on the plus side), protecting me from the swarming midges. I eventually resolve that the midges will not allow me any more rest, and I have no choice but to pack up and get back on the bike. My alarm hasn’t gone off yet, and I’ve had less than four hours’ sleep. I could really use another four, but midges attacking my face isn’t great for recovery. It’s just after 4am and it’s already light out, anyway, so I pack my sleeping kit into my bags, and get dressed and ready in record time (twelve minutes, thank you) and wheel my loaded bike out from the greenway path I ‘slept’ on (although I think that amount of time only qualifies as a nap) and back onto the TransAtlantic Way route. My bike computer is still waking up when I see the lights of another cyclist coming towards me - surely an odd hour for anyone else to be out for a ride - and soon recognise Tom, the rider I met going up Mamore Gap on the second morning of the race. 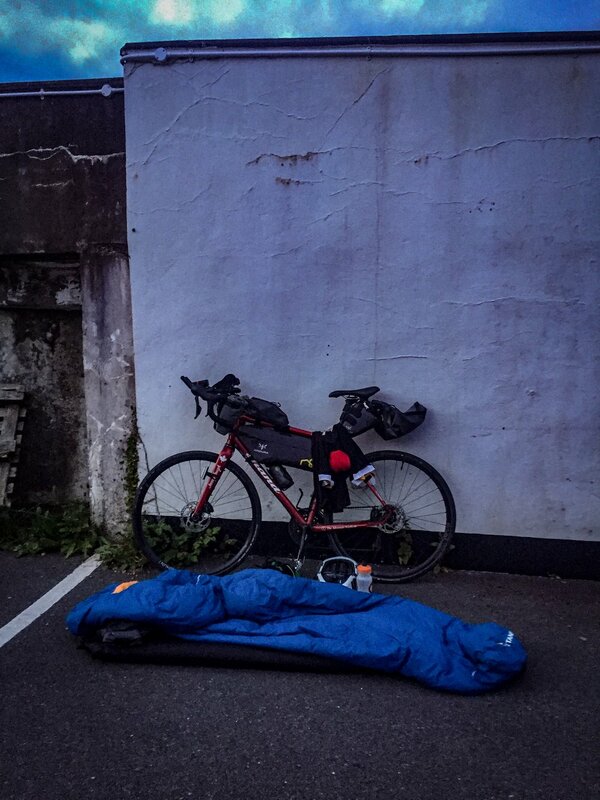 Having not inspected the route in much detail (I find the mystery of adventure more motivating than a carefully studied plan), I am confused and alarmed to see Tom riding towards me at 4am, but he assures me that I am heading the right way. It’s not until a couple of hours later, after I’ve cycled the loop-de-loops of Achill Island, waving at riders heading in all directions throughout, that I ride past the same spot where I had bivvied and finally realise that Tom and I were both, in fact, going the right way. The TransAtlanticWay Race is full of cruel and futile tricks, sending the racers in circles, zig-zags, and, worst of all, out-and-backs, and a rider needs to have complete faith in her navigation device. After Achill Island, the next major point of interest is Checkpoint 2 in Connemarra, just shy of halfway through the entire race. It’s less than 100km away, but no section of the TAW gives itself away that easily. The course is a relentless assault of steep grades and changeable headwinds (or rather, you change directions so frequently that you’re bound to have a healthy mix of headwinds, crosswinds and tailwinds). There are no ‘easy’ or ‘fast’ bits. Adding to the challenge is Sunday morning in Ireland, when resupply becomes a slight hassle. We might as well be racing in the wilderness. Around 11am I finally find a gas station that is open, and sit on the ground outside nursing a massive (and terrible) coffee and makeshift convenience breakfast. My short sleep is costing me, and my face is swollen from the midge attack. This isn’t my finest moment. The caffeine jolt helps, and soon I’m pushing the pedals again, my pace noticeably improved. It’s not long until Jeremy catches up, and I’m delighted to see my hometown buddy. Races like this attract all sorts of people who might never otherwise cross paths - that’s one of the coolest things about cycling events - but Jeremy and I grew up literally minutes away from each other in the same year on the other side of the planet. Our paths have probably crossed dozens of times previously but we never met until this small and extreme race that attracted only about 200 riders out of the whole world. Not only that, we’re even riding in the same position. I’ve been finding that whenever I ride with another racer my pace naturally improves and my mind is distracted from turning the pedals, so I’m grateful for Jeremy’s company as we make speedy work of getting to the checkpoint, which we sail into mid-afternoon. On arrival we are told that we’re tied for 27th place, but that I’m also in 2nd place if you only count the women. Even now, I’m still not sure whether I arrived in 27th or 2nd, and I guess that’s a matter of (probably heated) debate worth its own blog post. Either way, I was impressed at my standings, as I had decided to eschew the internet during the race (save for the responsible glances at weather reports) and had no clue until then whether I was 27th or 270th. I stare blankly, fighting my natural sarcasm as well as my irate inner feminist, both confused by six days of sleep-deprived racing and finding it impossible to produce a coherent rebuttal. Okay, not a strong response, but I’m really tired by this point, seven days in. The friendly - if a little stone-aged - shopkeeper is quick to assure me that he understands that women are nowadays allowed to participate in sporting events, but insists that this is “madness” - just one step too far for the humble female. I debate in my head whether arguing with him would end up affirming that I, and all the women in the race with me, are indeed mad. Even if we are, I’m not sure it’s gender-specific. Instead of engaging in a debate, which I don’t seem to have the cognitive function to do justice, I buy a Coke and some Pringles (they fit so nicely in my Apidura feedbags) from him and continue the long and jittery descent of Moll’s Gap. The male riders I’m with are surprised and baffled at the reaction - in a week of riding in a predominantly male field, it’s the first (and in the end, only) time I’ve received anything that could be classified as sexism. Following Moll’s Gap, the route makes another cruel loop, this time sending racers clockwise around the Ring of Kerry for around 170km before returning to the same spot to continue south. It’s a stunning summer’s day and, feeling accomplished from the two big climbs behind me and motivated by the beautiful sun sparkling on the Atlantic, I push the pace, keen to make up some miles and start closing the gap on the finish line. I’m flying down a long descent, letting the brakes sit this one out, blinking rapidly to stay awake. I’m so tired now that my head is bobbing, and during the descents, without the need to push the pedals to keep going, my body is rapidly entering Sleep Mode. This is bad. I pull in at a tourist tack shop for an emergency coffee, but briefly fall asleep sitting on the steps of the shop. I try to push on, keen to make the most of the good weather before Storm Hector arrives tomorrow, but after walking my bike up a steep hill that I have no energy to ride, then another terrifying sleepy descent, I know I can’t be on the bike right now. It’s still going to be daylight for a few hours, so I check into a B&B, take the opportunity to wash my shorts and my hair (both definitely needed), and get a much needed six-hour sleep. Looking at my mileage for the day - 235km - I’m devastated. I had kept my average well above 300km so far, and I can’t help but feel anything except that I have totally blown it. Gutted, deflated, and disappointed, I go to bed determined to make up for the loss in the morning. Storm Hector hits with all the fury of too many days spent racing in perfect weather. Ireland has just been teasing us - lulling us into a false security. The wind howls loudly in a sinister tone, and the rain pelts rather than falls, causing me to wince in pain at the sensation of millions of nails being thrown at my face. I determine that this is definitely the worst weather I’ve ever ridden a bike in, which curiously inspires me and I find enjoyment in the storm as my bike is swept back and forth across the small roads of the Beara Peninsula. At the top of a climb I am stopped entirely, standing on the pedals and pushing my lowest gear, fighting to push the bike downhill against the powerful wind. After several fun but challenging hours, the storm relents slightly as I pull into Castletown-Bearhaven (say that three times fast) to grab some dinner and load the bike up with supplies to get through the night. It’s now 300km to the finish, and I’m toying with the idea of doing that last effort in a long, final push, when Meg shows up at the shop I’m huddled in. Admittedly, I was not aware of that detail. Reluctantly, I start looking for hotels that I might be able to convince to let me check in quite late and leave quite early. It’s tempting to push through the storm, but I know it’s just a waste of energy that would be better saved for a fast ride in tomorrow’s better weather. Close to midnight, the storm returns as promised, as I push my bike painfully slowly up a long hill on a narrow country road. Meg’s light soon appears in the blackness behind me, and I’m glad to know I’m not alone out here as the weather lashes us once again. It’s another scary descent, this time on gravel that I can’t see in the dark night as the wind further tests my bike-handling skills. Thankfully, the B&B I had phoned earlier has waited up, and lets both Meg and me in for a warm and dry night, despite our state. The alarm goes at 4:30. The wind is howling again, that shrieking, malicious whistle, and I know that I have to start my day heading straight into it. My clothes that got soaked in the storm last night haven’t dried even a little, and I find it impossible to contemplate pulling on cold and wet bib shorts. I decided against bringing a second pair, and with only 230km to go in the race, I am having heavy regrets about that choice. I check Trackleaders for the first time, and see that Jeremy stayed in the same village and has already set out on the Sheep’s Head out-and-back, riding straight into that 65km/hr wind that I can hear outside my window. I decide I need to find the courage to get those shorts on and try to catch him. I stop for breakfast in Durrus with Meg, finally warm enough to remove a few layers (I had to put on all the clothes I had with me in order to face the wet shorts) and do one last faff with the bike. I decide I won’t stop until I reach the finish line, so want everything on the bike organised for efficient riding. I strap croissants to my handlebar bag’s bungees, stuff my feedbags, and optimistically leave sunscreen within easy reach. I raced the first 225km of the course (Dublin to Checkpoint 1) in 9.5 hours, and want to see if I can do the last 200km in a similar time, despite the 2000km of fatigue accumulated in my legs. With less than 50km to go, motivation wanes, for the very first time in the whole race. Now I know that I’m going to finish (but not catch Jeremy), and pushing the pedals for that final section loses its meaning. I take my phone off airplane mode and seek inspiration from friends back home, relying on a team of virtual cheerleaders and using Sarah Outen’s method of the invisible peloton - imagining friends and family riding alongside me and motivating me to keep going. I hammer the pedals, eager to just get there. The ride into Kinsale is beautiful, and I reflect that every section of this race has been stunning. I feel extremely lucky to be able to do this - to have the health and freedom that allows me to spend an entire week (plus a few hours) riding my bike around such incredible scenery. In the end it takes me nearly ten hours to finish the last 200km, and I know I left everything I had out on that road. I roll into the finish to a grand welcome from the riders ahead of me, and women’s winner Karen Tostee waiting with the beer that I requested at the start line seven days, seven hours, and 26 minutes ago in Dublin. Follow Jenny on Instagram and Twitter for more.